Iranian hard-line volunteers have been banned from going to Israel to carry out suicide missions. Ayatollah Khamenei issued the edict after thousands of students signed up to sacrifice their lives for the Palestinians. The would-be martyrs gathered in front of the Egyptian Consulate in Tehran to protest against what’s taking place in Gaza. Their slogans criticise what they see as the indifference of the Islamic and Arab world to what’s going on there and urge the end of violence against the Palestinian people. Many protesters call Israel's actions in Gaza genocide. “We are a group of students. We came to the Egyptian Consulate to demand that they open border crossings for the wounded and allow humanitarian aid to come in. We cannot abandon the Palestinian people during this genocide,” one says. 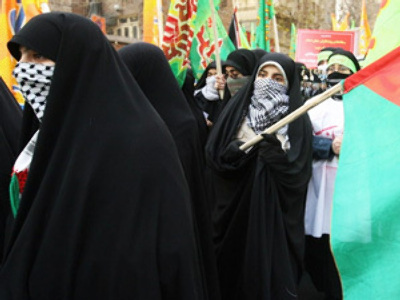 The Iranian people have threatened to declare jihad. Many are prepared to die for their Islamic neighbours. Shortly after Israel started attacking Gaza, Iran's supreme leader issued a religious decree saying anyone killed while defending Palestinians would be considered a martyr. Since then student groups claim more than 70,000 people have joined up as volunteer suicide bombers. However, on Thursday, Ayatollah Khamenei banned volunteers from leaving the country to take military action against Israel. Nevertheless, the leader says Iran won't spare any efforts to assist Hamas in other ways. He’s also concerned that some Arab countries have not done enough to assist the Palestinians. “The governments of Muslim countries situated around that region (Gaza) are making a mistake by not offering any help. The deeper the nail of Israel is hammered in, and the stronger the dominance of arrogance becomes, the misery, weakness and abjectness of these states will increase. Why aren't they conscious?” Ayatollah Khamenei wonders. With Iran firmly backing Hamas in Gaza, Iranians are unlikely to stop their protests until Israel ceases its aggression or the Arab world responds.